The best UK house plans on the web! Self Build Plans is your home for the largest online collection of top-quality architectural house plans. Make your dream home a reality and save yourself thousands in architects' fees by purchasing house plans directly from Self Build Plans, where you'll find the best house designs in the UK. We have the largest collection of house plans online, making quality home designs affordable. All our plans have been constructed previously for added piece of mind. Whether you’re looking for Bungalow plans, 2 or 3 Storey plans, semi-detached plans, 5+ bedroom house plans, we have them all. Search and explore our house plans online, in the comfort of your own home. 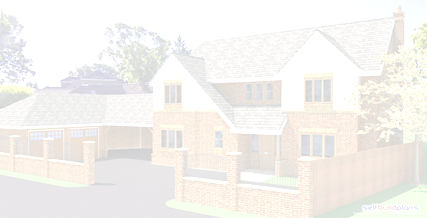 We also offer full garage plans to compliment your chosen house plans and if some aspect of the plan is not to your liking please contact us to advise on your specific requirements or amendments to any plan. Thousands of house plans are available from our online shop or contact us for any specific bespoke designs or small amendments to our many house plans on TEL: 0161 4080438.